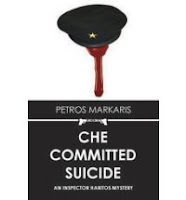 Petros Markaris's newly translated Che Committed Suicide covers some of the same territory as recent Irish crime fiction: what happens to revolutionaries when the revolution is over (whether they won or lost). Markaris's likable Inspector Haritas was shot at the end of the previous novel, and is on sick leave for most of this one (and he and his wife are getting on one another's nerves). The very public suicide of a former activist (and former prisoner in the Greek Junta's military prisons) on TV gets Haritas's interest, but the police aren't paying any attention until after two immigrant laborers are murdered and a second suicide of a former comrade in arms, also public. Ten days after the first suicide, a biography of the dead revolutionary appears--and a week after the second, another biography appears, from a different publisher but the same author. Are more suicides on the way? Haritos's replacement as head of homicide believes the claim of responsibility by a right wing, anti-immigration group, but Haritos can't see how the group would have forced the two public figures to kill themselves in such a public way. Most of the book, all told from the Inspector's point of view, shows him going back and forth among family members and business associates of the two suicides, while also talking the case over with his daughter and her fiance and an informant in the press and a former communist. 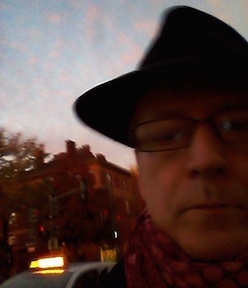 He also drives his ancient Fiat around Athens a great deal, and there's a lot of detail about his routes--not the scenic Athens by any means (the city sounds hot, dirty, treeless, and crowded)--rather like George Pelecanos's tours of Washington DC's underside. It's a long book and it develops slowly, but the characters hold a reader's interest, and the plot is very unusual (how, indeed, is someone induced to commit suicide publicly?). The denoument is believable, sad, and political--if you've never seen the movie Z, see it now for its own merits and for the background it provides to Markaris's tale of ideals, ideals lost and betrayed, lingering faults in a society that has healed only on its surface after a turbulent repressive past, and families at their best and worst. Somewhere along the way, Arcadia Books' EuroCrime series changed the cover from the graphic that appears above to a night shot of the Acropolis with a noir street scene below it. I think the graphic is a better representation of the novel, but the contrast of the night streets and the bright Acropolis is also effective (reproduced at the top of the review, though it may be a bit hard to see in this small version). What do you think? Which would tempt you into picking up this very interesting book? Brim over I assent to but I about the brief should have more info then it has.